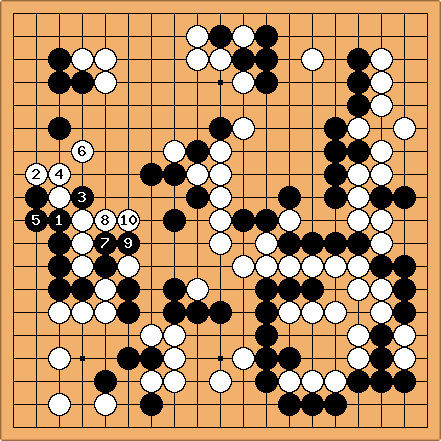 The problem was taken from a KGS game between a 7d and a 6d. The problem position was reached at move 167. The marked black stone was played as move 155. My question is which, if any, of the moves 156 to 167 are more urgent, or failing that larger, than killing the black group on the left. I count the black group on the left as very near 30 points. I wonder if this is not one of a difference between pros and amateurs. When move 141 was played, one person commented that was bad shape, preferring to have seen the move played at .